Soup is great to eat while on a detox. You can get so much goodness into a bowl, keep it gluten and dairy free and vegetarian and vegan. I was about to share my tasty Mushroom Vegetable Soup with you which I made using Melissa’s recipe as a starter from Gluten-Free For Good and realized I had not shared my recipe for easy Vegetable Stock. It’s so easy I don’t really think of it as a recipe but it’s a great time and money saver. 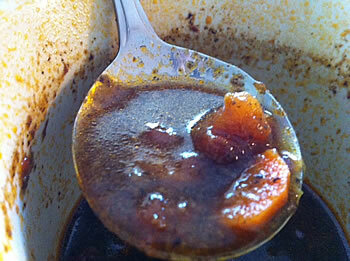 This soup is great for detoxing and fighting those flu and cold cooties Melissa talks about. Grab her recipe and make it fit your needs. I wanted to keep mine vegetarian and I also added in more than just shiitake mushrooms. I added portobello too as they have a hearty flavor. I also switched out the canned tomato sauce for a box of Pomi Chopped Tomatoes (affiliate link). I made a nice big pot and then froze it in portions with my soup mugs that have lids. Great to pull out when I want soup that I know is all good inside. I love using vegetable stock to add extra flavor when cooking and it’s a must when making a vegetarian soup. My favorite way to make stocks is in the crockpot and overnight. So how darn efficient is that. If you really want to save even more time and money save those scraps as you are cooking and toss them into the freezer to pull out and put into your crockpot or stockpot. Things like the onions skins, carrot tops and peels both add great flavor. I wish I could say I remember to do this more than I do. This recipe will make a light vegetable stock. If you would like a deeper richer color and flavor, roast your vegetables first and then make the stock. Add your vegetables and seasonings to the crockpot and fill with filtered water almost to the top. Put the lid on and set on low for 8-12 hours and go to bed. In the morning check stock tastes the way you like and strain into a large bowl. If it’s not strong enough taste let it cook a little longer. Pour the stock into useable containers and either use now or freeze for later. How is Diane’s Detox going? Have you been trying anything new? How do you feel? Have you had some soup too? Great recipe for stock. I tend to always make chicken stock (there's a lot of chicken bones/carcasses at any given moment in my freezer!) but I need to make veggie stock more often too! I find soup of any kind to be my go to comfort food. Feeling pretty great. I only had to make a few minor tweaks to my diet to follow your easy cleanse, but glad to take it to the next level, for sure. I did fall off the wagon once this week:(. I had a glass of wine when a friend visited, and some bagged tortilla chips. But not much to speak of, and I returned immediately to the program at hand! I love this veg soup stock recipe. It is similar to one that I make (I roast my vegetables in the oven and then proceed with finishing the stock on the stove). I'll definitely give this one a try….easy peasy. Oh, and a tip….when I make homemade stock, I always freeze a few ice cube trays of the stock, then pop the frozen cubes into a freezer ziplock bag, for those recipes that only call for a little bit of stock to enrich a sauce.